Only a decade after opening their doors and then the hearts and minds of young students in San Francisco's Mission district, groundbreaking nonprofit 826 Valencia now has seven national chapters and outposts as far away as Dublin, garnered a legion of devoted volunteers, and sent many promising writers out into the world. Their ambitious creative writing programs empower students to express themselves with passion and conviction. In honor of their 10-year anniversary, they've asked would-be authors (including children and adults) to round up pledges for 8/26 Day, then join them at 826 Valencia on Sunday, August 26 from noon to 8:26 p.m. to write. According to Programs Coordinator Miranda Tsang, 8/26 Day participants will receive marathon bibs with literary words like "synecdoche" on them. She promises fabulous prizes, live tweeting, and old-school typewriters will be set up outside. Special guests like authors Dave Eggers, Vendela Vida, and Lisa Brown will also make appearances throughout the day. When Eggers and Ninive Calegari founded 826 Valencia, they knew they had an incredible volunteer force at the ready, but they could never have anticipated that the organization would expand with international satellites. Calegari is proud of "the core values that have permeated -- we treat teachers well and work hard on their behalf." She counts "the success of the Writers' Room and going to the White House and being acknowledged at that level" as some of the enormous highlights of the past decade. "One day, I was waiting in San Francisco to go in for lunch and a little boy ran into the tutoring center. He was so excited to do his homework, he almost knocked me over. In Boston, I witnessed the same excitement at their tutoring center. It's powerful to see someone running in to do their homework. It says a lot." The San Francisco Writers' Grotto has joined mighty forces with 826 Valencia to activate fundraising efforts. They'll offer a one-hour free-write class at noon based on the Grotto's new book, 642 Things to Write About. Copies of the book will be available for purchase with a portion of the cost going to 826 Valencia. Local author Janis Cooke Newman will lead this workshop to kick off the write-a-thon based on a creative writing class she taught at the Grotto. She says, "We'll shout out one or two of the prompts from 642 Things to Write About like 'You're being chased by a killer!' or 'You'd just die if anyone ever saw this diary entry,' or maybe just, 'Arsenic!' And then we will set a timer for five minutes while everyone free writes. There's only one rule -- you have to keep writing." Volunteers are invited to share their work out loud. Then Grotto teachers will offer the writer (and everyone else) feedback, writing tips and tricks inspired by the piece of writing they've just heard. The Grotto will donate a free Grotto writing class to anyone who raises at least $1,000 for 826 Valencia during the write-a-thon. When her son was in fourth grade, Newman saw firsthand the tremendous impact 826 Valencia has made on the San Francisco community. "He made a field trip there and I've never seen so many kids get so excited about writing a book together. This is an incredible opportunity for kids." She believes, "as education budgets continue to be slashed, we need organizations like 826 Valencia more than ever." Calegari dreams of a future 826 Valencia filled with former students. She says, "I'd love for our students to become tutors and then directors and to see them feel so connected they come back to give to kids in the future. This cycle of generosity would continue because they feel grateful." Of course, she'd love to see more donations to support the underserved kids. There's a limit to how many they can serve. With her new documentary American Teacher (on the Documentary Channel this September), she hopes "to elevate the teaching profession by collaborating with teachers' unions and finding ways to retain and award teachers." 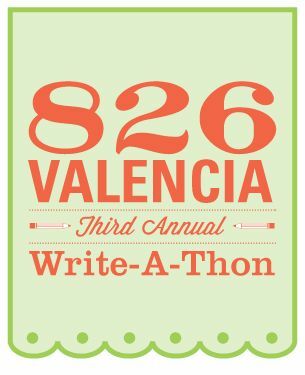 To sign up for the 826 Write-a-thon click here.